Over the past few days I have been analysing the data collected on Whiteknights campus at the meterological station for both temperature and rainfall for the past 43 years. This is a large set of data, covering a reasonable length of time, showing both expected trends and some surprising results. 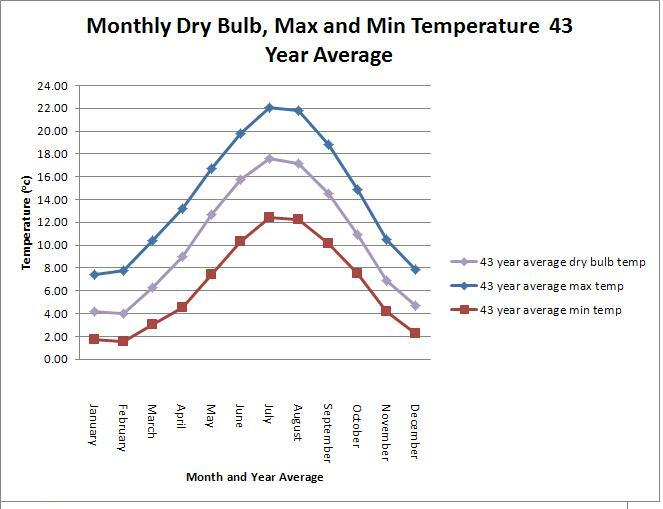 The data analysed for temperatures was the dry bulb thermometer average, Dry bulb maximum temperature and dry bulb minimum temperature, this data could all be obtained on a daily basis from the Universities Meteorological Department. As a result of this, I have averaged the data for each month to shrink the data set, allowing the data to be plotted onto a series of graphs. 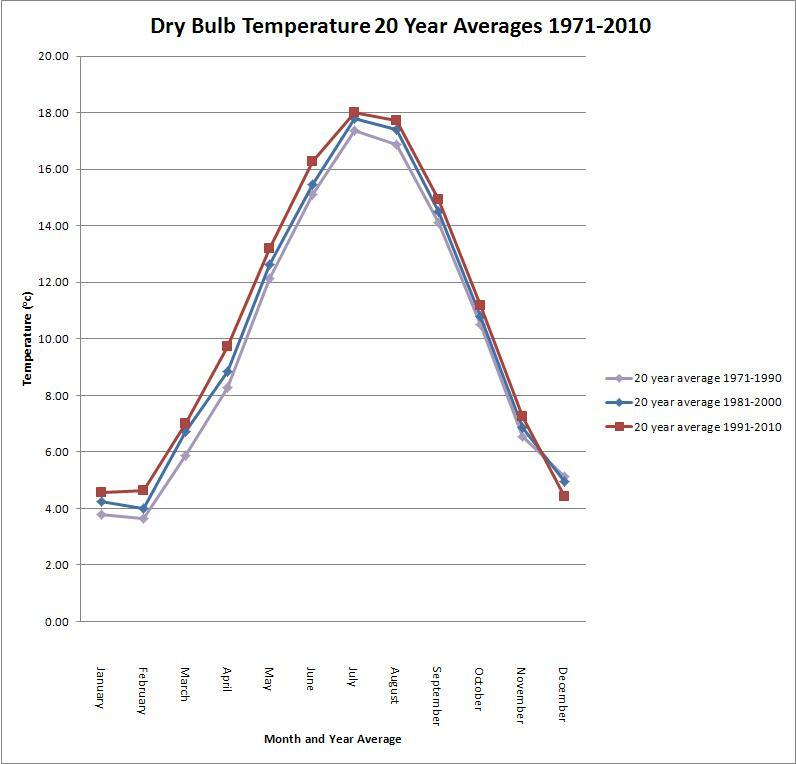 I have also calculated the average dry bulb, maximum and minimum temperature for the decades 1970-2009 and the 20 year averages. 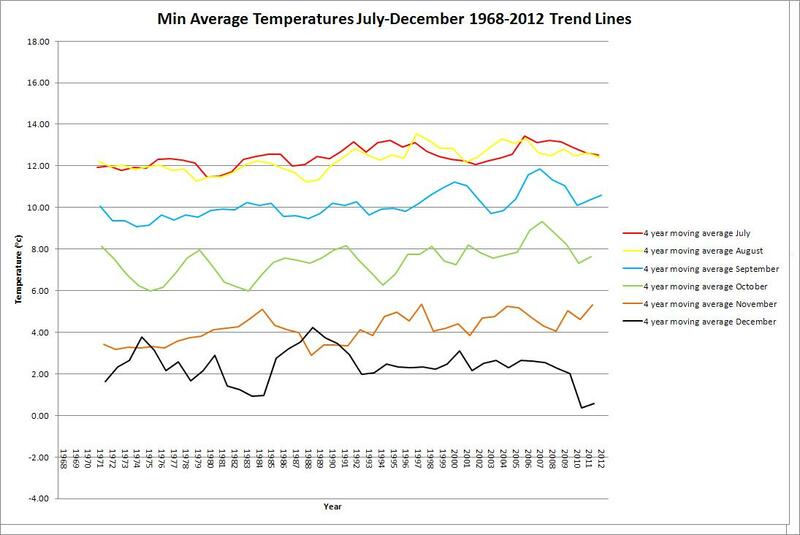 The average yearly temperatures were also calculated. 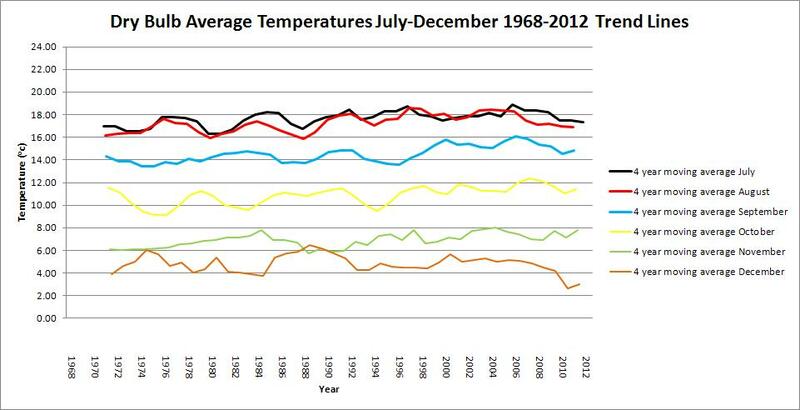 Finally, the 43 year average temperature was calculated for each month and the year. 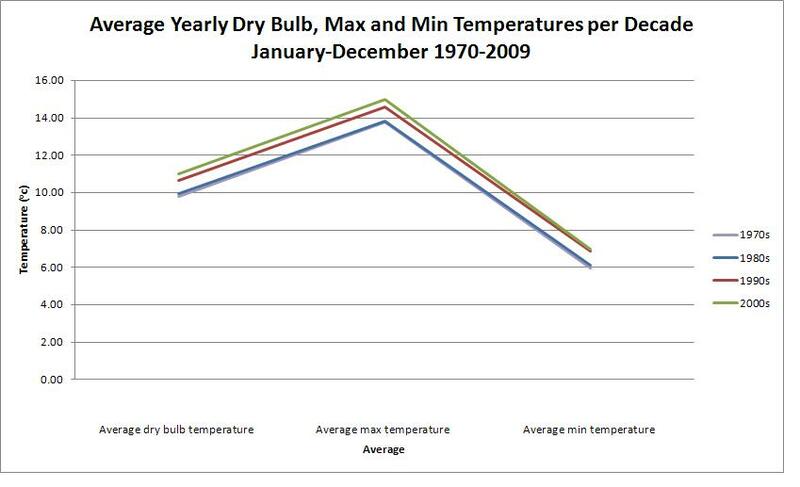 The dry bulb averages, maximum and minimum temperature see graphs 1-6, in the gallery, show a steady temperature increase especially, from March to November, with little deviation from that trend. 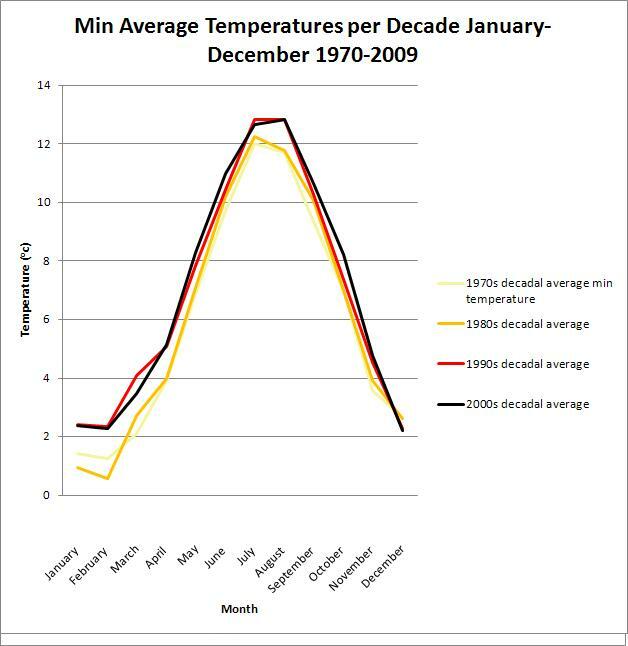 However, even though winter temperatures have generally increased, they do show greater variation, with temperature declines in the 1980s and a general decrease since 2008, after a period of steady temperatures / slight increases from 1990. Interestingly, over the whole period, December seems to be showing a downwards temperature trend. 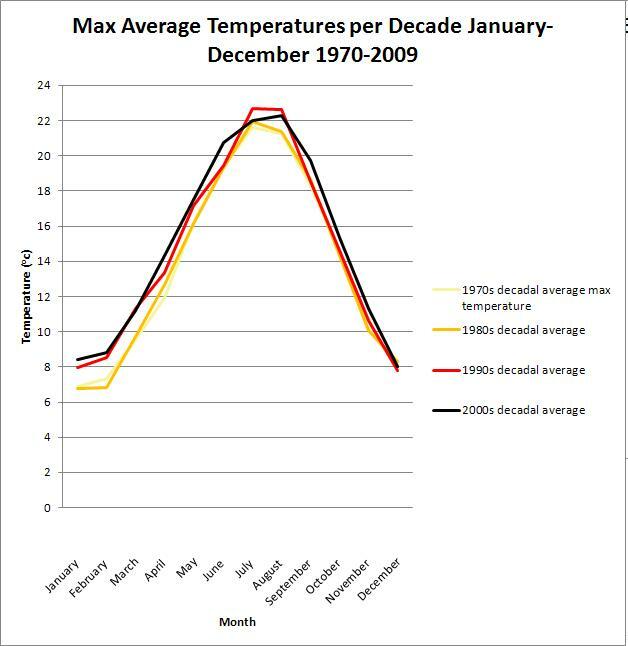 Temperature increases/decreases are also supported by graphs 7-10 both by changes per decade yearly and monthly which also highlights the increases per decade, becoming markedly clearer since 1980. 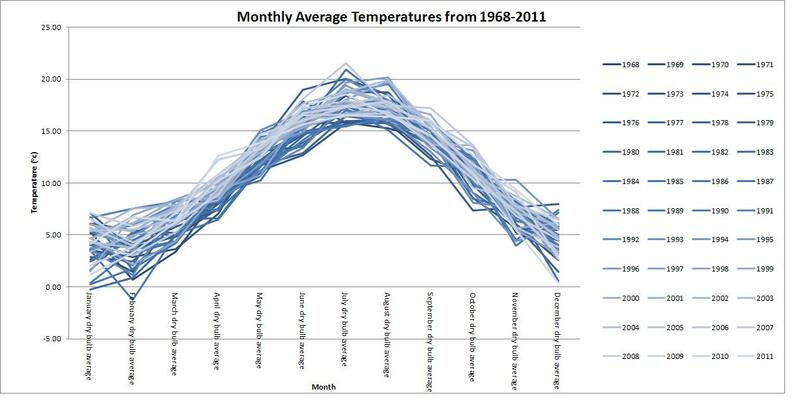 Graph 11, although hectic, also shows how the most recent years in light blue, are showing higher temperatures per month than earlier years. 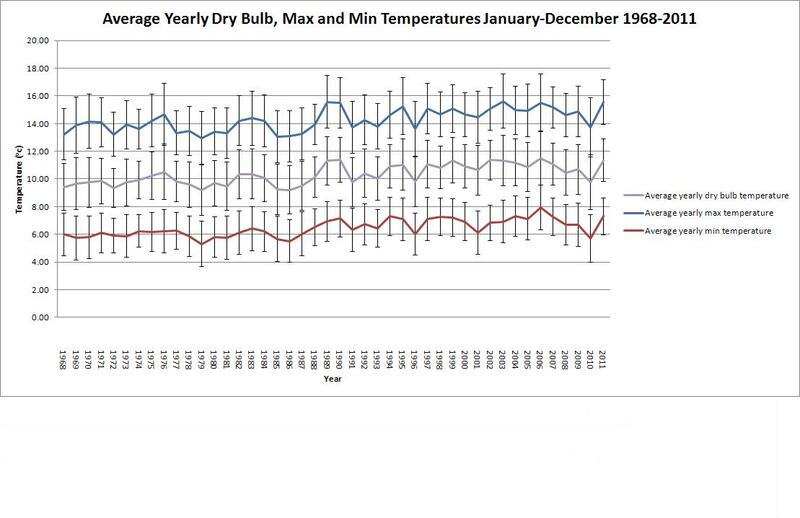 The dry bulb decadal average yearly temperature also indicates steadily increasing temperatures, having increase by 1.2°C from the 1970s to the 2000s. 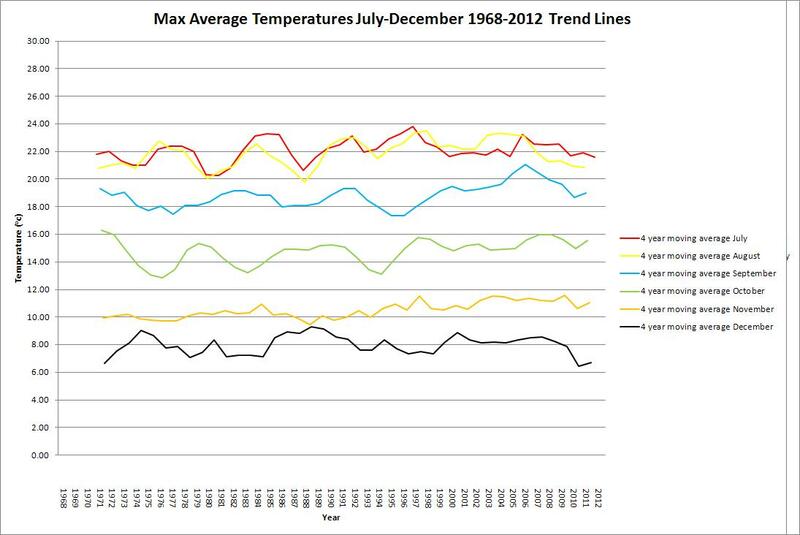 The maximum yearly temperature, shows a 1.22°C increase from the 1970s to the 2000s and, support from the minimum yearly temperature, having shown a 1.02°C increase from the 1970s to the 2000s. 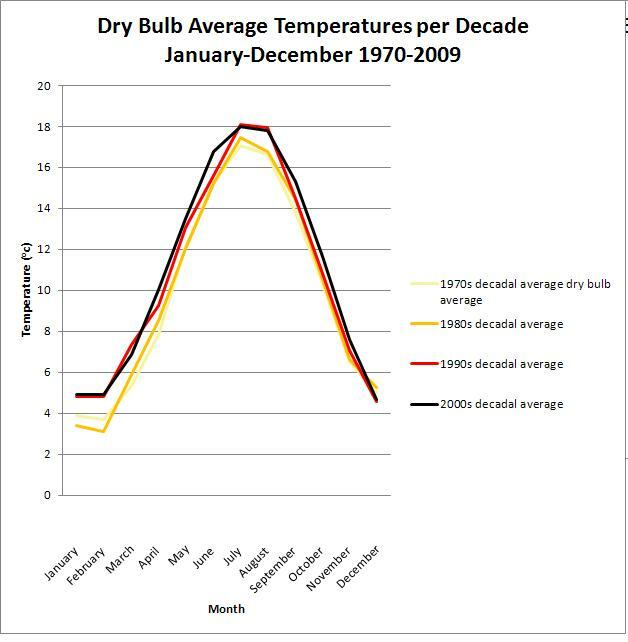 There is also sign of a gradual increase from graph 12 showing the average yearly dry bulb, max and min temperatures from 1968-2011 steadily increasing year on year. In many cases this difference is almost 2 degrees C since 1968. Interestingly, although the 3 lines show very similar spacings from one another, the standard errors indicate, that the data is correct as there is variation in the data (the averaging of data having smoothed any sudden changes, whilst still showing the overall trend). The 30 year average yearly temperature (the commonly used dates being 1971-2000) for Whiteknights Campus is 10.17°C, highlighting that 10 of the last 11 years since the year 2000, have been above average and in some cases by over 1°C higher. The 30 year average from 1981-2010 (soon to be the next average used by the met office UK) has increased to 10.53°C on campus, 0.36°C higher than the 1971-2000 average. This upward trend has continued, with 2011 continuing above the 1981-2010 average of 11.35°C. 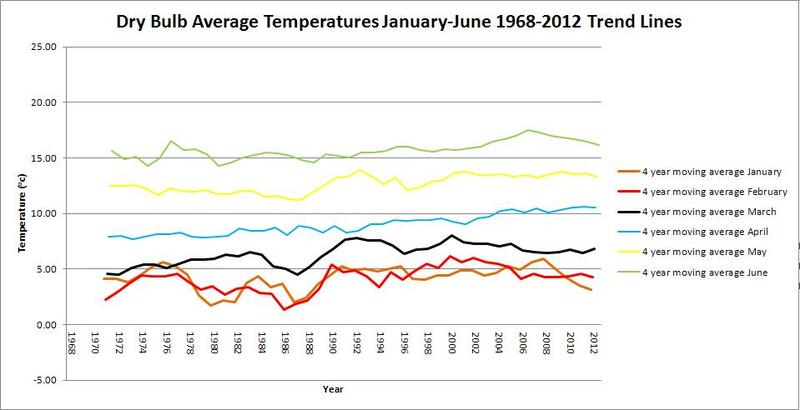 2006 has so far seen the highest yearly average temperature of 11.48°C whereas, 1979 was the lowest at 9.17°C. 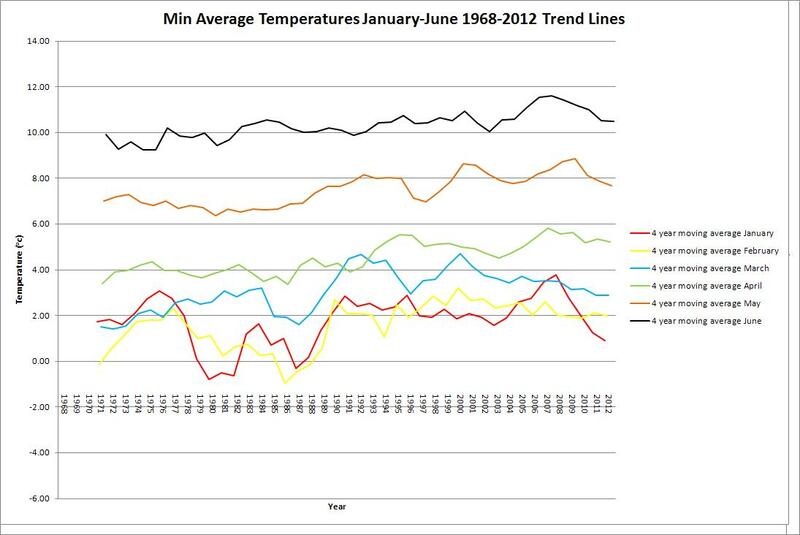 The trend of increasing temperatures can be more effectively show by using the 20 year average see graph 13. This highlights the average temperature between 1971-1990 as 9.94 degrees C increasing to 10.35°C between 1981-2000 and increasing yet further to 10.74 between 1991-2010. 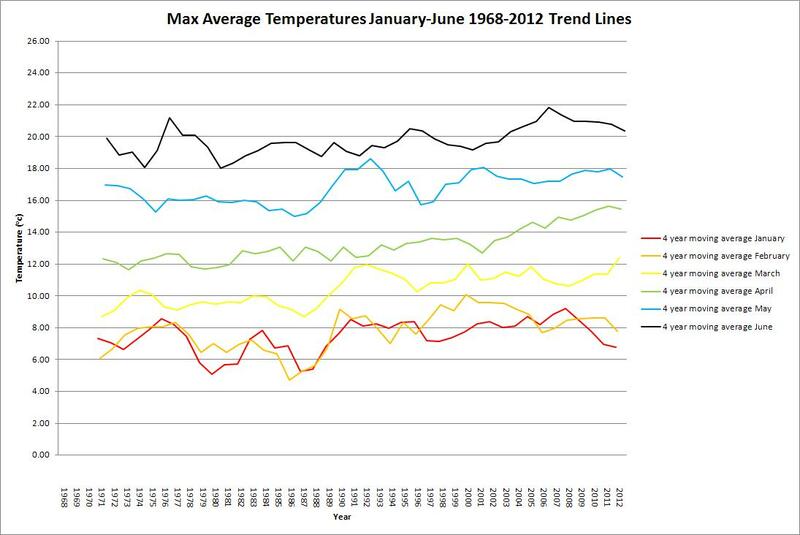 To end, graph 14 shows the average expected temperatures per month calculated from the last 43 years. As a student of Ecology and Conservation at Reading University i am very interested many other insect groups, botany and the interaction in nature. Over a number of blogs I hope to pass my knowledge to others but also gain from the many other interesting posts. This entry was posted in Climate and tagged reading university, temperature. Bookmark the permalink.